Astutely moderated by Nicole Bigby, partner and general counsel at Bryan Cave Leighton Paisner, the panel included Cherie Blair CBE QC, founder of Omnia Strategy LLP, Lord Goldsmith PC QC, co-managing partner of Debevoise & Plimpton’s London office, and Stephen Jagusch QC, global chair of international arbitration at Quinn Emanuel Urquhart & Sullivan LLP. Lord Goldmsith, formerly the Attorney General for six years under the Tony Blair government, started by making clear the premise that businesses were now very much aware to the human rights implications of their activities and were generally more active in trying to prevent and remedy any breaches themselves. Cherie Blair, later in the discussions, pointed out that in an age of instant communication and increased awareness from the wider public, including consumers and employees, around human rights issues, businesses were ‘one mobile phone photo away from a PR disaster’. Much of the debate concentrated on the advantages for businesses and potential individual victims of human rights abuses offered by arbitration as a means of resolving disputes as weighed against the challenge of putting into practice this still relatively novel concept. The success of the international arbitration community in creating an effective means of enforcing awards in complex cross-border disputes, in large part through the 1958 Convention on the Recognition and Enforcement of Foreign Arbitral Awards (the New York Convention), could serve as an inspiration for effective means of enforcing human rights breaches globally. The flexibility arbitration offers, especially as compared to the more rigid and procedure-bound court-based systems, is another key asset, allowing arbitration to be moulded and wrapped around such complex issues as the protection of human rights. Finally, the ability for parties to arbitration to appoint their own arbitrators confers some legitimacy to the decisions made by the tribunal in what are very emotionally charged and personal disputes. Implementing means of resolving business and human rights disputes through arbitration faces several significant challenges, however. Stephen Jagusch astutely pointed out that there are currently very few people with deep knowledge of both human rights and how to resolve business disputes through arbitration, making the initial pool of arbitrators to select from very shallow. Cherie Blair and Lord Goldsmith also stressed the importance of ensuring equal levels of representation in a process that is currently well known to and commonly used by businesses rather than victims of human rights abuses. Helping promote more diversity among arbitrators generally was viewed as a means of alleviating these two potential issues. The panel certainly helped feed the debate as to how the know-how and successes and the international arbitration community could be deployed to help remedy abuses of human rights implicating businesses. 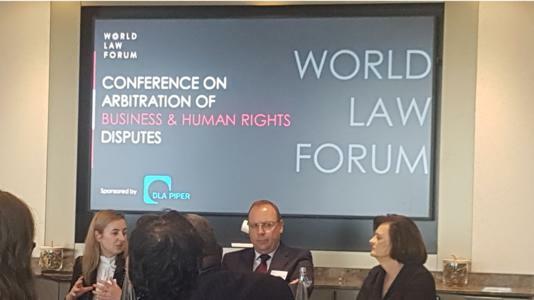 But Cherie Blair summed up the situation well when stating that ‘the topic of human rights is overly a political topic while arbitration is not a perfect solution to remedying breaches of human rights, nor should it be the only one’.